A record 8% of households with minor children in the U.S. are headed by a single father, up from just over 1% in 1960, according to a Pew Research Center analysis of census records. The census bureau data shows the number of single father households increased from less than 300,000 in 1960 to more than 2.6 million in 2011. 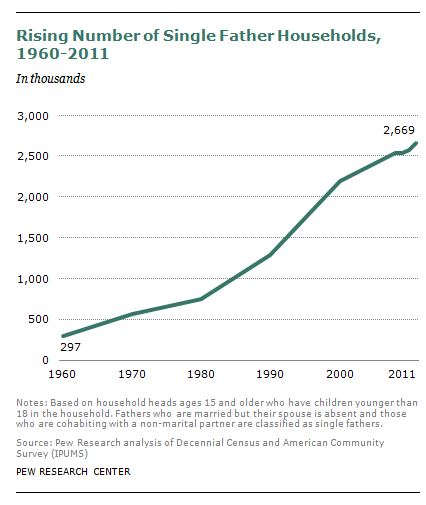 To measure the increase in another way, single parent households headed by fathers now comprise almost one-quarter (24%) of all single parent households, compared to 14% in 1960. There are some notable differences between single mothers and single fathers. Single fathers are more likely than single mothers to be living with a cohabiting partner (41% versus 16%). Single fathers, on average, have higher incomes than single mothers and are far less likely to be living at or below the poverty line—24% versus 43%. Single fathers are also somewhat less educated than single mothers, older and more likely to be white.